The development team’s revised schedule for all noise-related construction activities began last week. This effort to minimize the impact on neighboring residents and businesses, as well as commuters passing through the area, has addressed many concerns about disruption and inconvenience. Coverage of the schedule adjustment was featured in Bethesda Magazine. 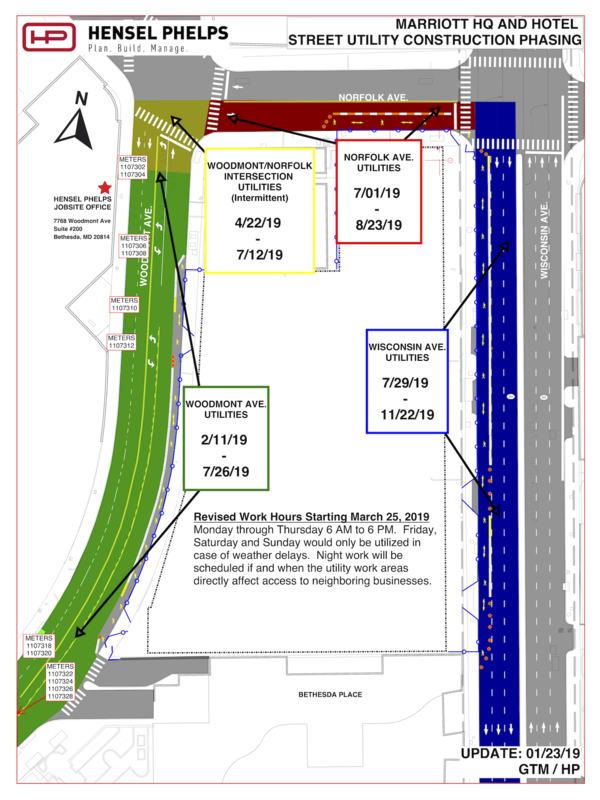 The revised schedule includes traffic control operations starting at 6 a.m. and work occurring between 7 a.m. and 6 p.m., Monday through Thursday, along with brief, less-intrusive activities during lunchtime hours from approximately 11:30 a.m. to 1 p.m. While the main activities will occur during these hours, certain portions of the work will need to occur during the overnight hours from 6 p.m. to 5 a.m. In the case of inclement weather, work may take place Friday through Sunday. 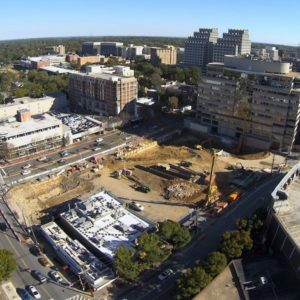 General Contractor Hensel Phelps has obtained an updated noise waiver from Montgomery County to continue evening construction at the site. 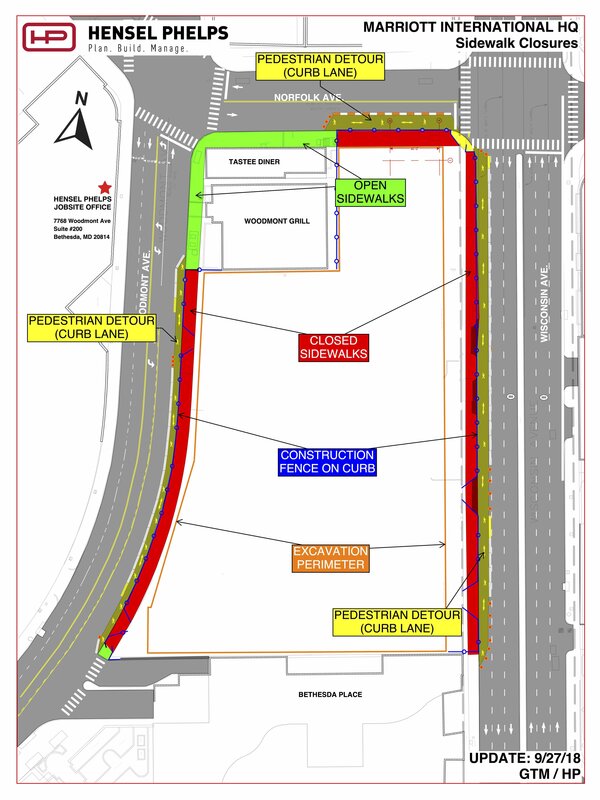 This week, daytime traffic along Woodmont Avenue is expected to lessen as the ramp into the construction site is relocated from Woodmont Avenue to Wisconsin Avenue. 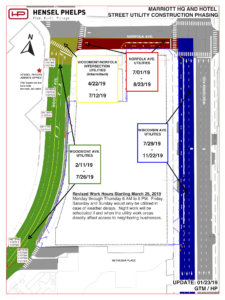 Throughout this time, the approved Montgomery County and State Highway traffic control plans will ensure minimal impact to traffic flow around the site. Meanwhile, mass excavation and hauling continue at the construction site. Intermittent bedrock blasting may be required in the near future, and advance notice will be provided. 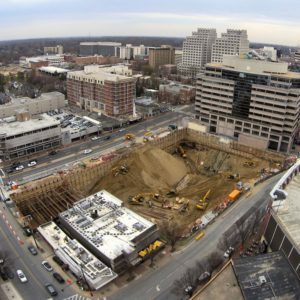 The mass excavation and hauling are anticipated to continue through July. It is anticipated that concrete operations will begin in May. Two streetlights along the east side of Woodmont Avenue will be removed to accommodate certain construction activities, but temporary solar street lighting has been installed to ensure pedestrian pathways remain lighted until permanent street lighting is installed. The next update will take place this Tuesday, April 2, at 6:00 p.m.